it is our job as parents. Sometimes we don’t have to lift a finger to do it! Nice to see a post from you. Hope you’re doing well! I told my son that just as it was his job to embarass me, it was mine to do it to him. He would just say “Moooooom” and leave it at that. Recently, when a bunch of his friends were over and had just left, jacob put his arm around me and said, “my friends think you’re pretty cool.” And while i haveno idea what brought that, i’ll take it. But i’ll also continue to embarras him. Well, you are pretty cool. And if you can get your kid to say it like that (via friends), that’s the golden ticket right there. You’re doing all right. It’s funny, as a teenager I swore I would never embarrass my kids the way my parents embarrassed me. Now as a mom, even when I just act normal, it can embarrass them. My daughter likes for me to drive our Jeep instead of the minivan to drop her off at school. I remember clearly at her age how I would duck down on the floorboard of the family car because I didn’t want anyone to see me. I guess it’s payback at how silly I was. wait till you become a grandparent – then youw ill have 2 generations embarrassed at you! Oh, yes! How could I forget! You’re a good mom. Just be sure to never do that hold hands with your sweetie in the mall thing – that would be unforgivable. I’m not sure they’d survive the holding hands thing. They collapse when my husband hugs me in the house. It comes naturally to me…haha! Nice of you to be a good sport about it. Hi! love your blog and your comments. My two children are 21 and 31; but so much of this just “brought it all back” and had me laughing! 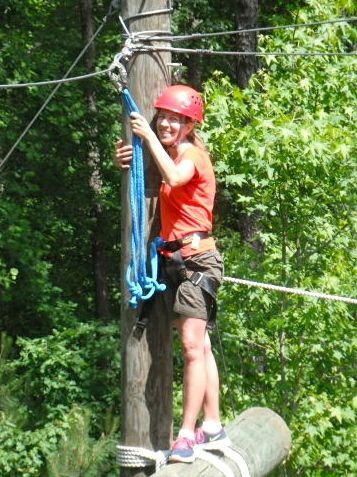 i love your ropes course picture. Keep up the great work! Yes, that is a lovely photo isn’t it? We have to laugh at ourselves if our children can’t. 😉 Thanks for stopping by. We’re not there yet. I still get the “your the best mom in the world” notes which I stash away so I can pull them out in a few years when they’re screaming I hate you at the top of their lungs. I still have those notes. I will never get rid of them. And I still get them from time to time. A handmade note means a lot these days! Yeah, my kids should give me much more credit! I wear actual pants to the drop-off line at least. My son is in middle school and suddenly just the thought of me merely breathing too close to him and his friends is enough to be embarrassing. I expected it with my son, being in middle school and all. But coming from my fourth-grader, I thought I had a little more time with her. I actually got a shushed “Mom, you are embarrassing me!” from her a few weeks ago when her friend was over. I work at my daughter’s school and she won’t even get out of the car with me in the morning! Oh! I’ve never heard that one before! I love kids’ perspective sometimes. It’s great. I fear this daily. Thanks for the humorous take! “Isn’t getting tangled up in the seatbelt like a fly in a web more embarrassing than having a mom?” I love it! I’m starting to see some of this embarrassment from my first grader…. I didn’t know it would start so early! I actually remember on the rare occasion when my grandfather drove me to school (it was walking distance) that I was mortified to be dropped of. I really can’t even say why because it wasn’t like I was the only one! Maybe I felt like it made me stick out or pegged me as a baby kindergartner instead of a mature 8. I think my brain was broken during all of the growth rewiring. I can say I definitely remember being embarrassed by my parents but at 18, going into 19 soon somehow I realize that they do mean well and they’ve given me pretty much the best of everything, I can’t imagine what life is going to be like after they’re gone, so these days I’m happy they embarrass me, because it reminds me that I still have them here with me. Hi there! I have just found your blog and reading it made me laugh out loud! I think that I’ve started to embarrass my nearly 10 year old Daughter – just little things here and there that didn’t bother her before but now are no-no’s! Ha ha! no doubt there will be a lot more of that to come in the future for her!! I look forward to reading more of your posts in the future. This is such an awesome post – sometimes I feel like all I do is embarrass my kids, thought I have to admit, it works both ways and I cop my fair share too! Thanks for sharing! My kids are embarrassed that I wave to them from the front door. Who is even watching? They know when I really want to get them, I sing and dance while I drive down the road. That’s payback. ; ) I still get a hug at home, even from a sixth grader. And when it happens, it means the world. I love this! I’ve been embarrassing my kids for years (now and then I even do it on purpose. 😉 ) Now, at 19 my son will look at photos of himself at 13 and say “Why did you let me wear my hair that long?! I look like a dork!” Apparently he doesn’t remember my pleading with him to get a hair cut and being told that I “just didn’t understand about being cool”! Thanks for the giggles! Oh yes, I’ve gotten that one already about the hair. Sometimes they embarrass us! 😉 Thanks for stopping by. It is my job as a mom to embarrass my kiddos. If I don’t, I must be doing something wrong! I am officially terrified. I remember the days of trailing behind my parents, keeping as much distance as they would let me. I have to say my mom was “the mom” of my friends…hoping I can earn that spot as well. My mum once turned up at my school on her bike wearing a pac-a-mac coat – this was at a school wear most people’s parents would turn up in a Jaguar or similar high quality and expensive car. I nearly died of embarrassment. It wasn’t even like the bike was nice either, it was about 30 years old and falling apart. At least we know we can keep the tradition going. That’s great! Hi, I just found your blog. Loved this post. I have two kids and my older one is in kindergarten, but I know they will be all grown up soon and I will soon be the embarrassing mom. Kinda looking forward to it! Hoping im better at handling this phase than my parents were. Also kind of comforting to know, that no matter what culture or background your from…being a mom is the same everywhere. That’s a comment we all need to hear! It’s true. “Being a mom is the same everywhere…” And it’s tough! Thank you. It’s comforting to know we are not alone, isn’t it? I don’t know why they’re embarrassed though. They even outrightly say in front of us, “mom you’re embarrassing us” when we try to be too cool! My kids are still little and this new world you describe scares me. My parents were embarrassing, sure, but I’m so super cool! I enjoyed your blog–thanks. I’m new to the blogging world and just posted about (much younger) kid fashion. Please check it out if you have time and let me know if you have any thoughts for me on getting started: kirstinode.wordpress.com.